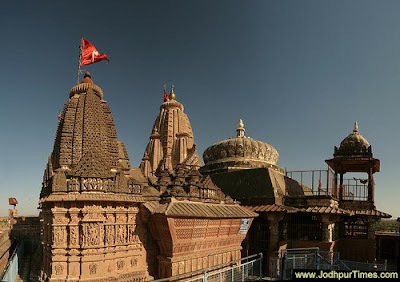 Sachiya Mata Temple Ossian, Jodhpur: Ossian Sachiya Mata temple near Jodhpur was originally built in the 8th century. The Sachiya Mata Osiyan Temple in Rajasthan is dedicated to Sachi Mata. Sachi Mata, also known as Indrani, was the consort of the rain-god Indra. The mother goddess Sachiya is worshipped by Marwadi Maheshwari, Panwar Rajputs/Parmar Rajputs, Lakhesars Kumawat, Oswal, Charans, Jains, Pareeks, and many other castes living in Rajasthan, Madhya Pradesh, and North India. This temple was built by the Parmar King Upendre for his Kuldevi in the 9th to 10th century C.E.